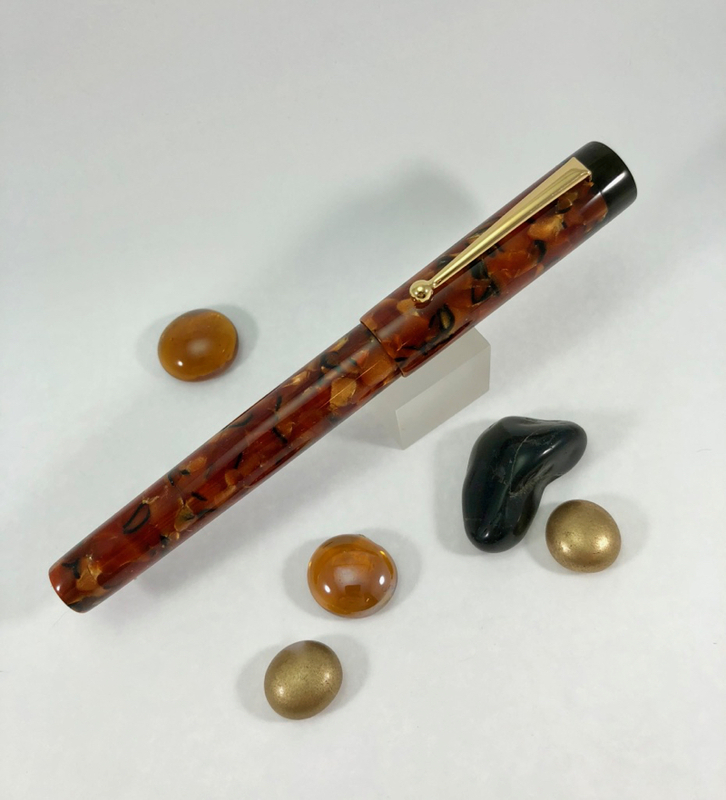 One of the challenges faced by almost all those associated with the crafting of custom writing instruments is the sourcing and design of materials. Nibs, clips, roll stops, and other decorative elements become part of the brand’s identity, and so must be chosen carefully. There are many factors to take into consideration, the main being the proportional dimensions and aesthetics of the finished item. Ready made parts from “kit” offerings rarely fit these requirements, so we must look elsewhere. The most difficult item to source? Clips. After initially making a brief foray into the possibility of getting custom steel clips made, around 4 years ago, I put the idea aside as untenable for my little business at the time. All the options I found were jaw-dropping in both price & quantity required, and clearly not something I could afford. However, several years later, I found the issue arising again. This time, I was determined to make it a reality. Little did I know what a challenge it would be! Obviously, with my former career in teaching, I knew next to nothing about the world of manufacturing, or even of how to begin to find someone to create clips to spec. Another obstacle to overcome was the understandable tendency of well-established pen makers to hold their own sources and findings close to the vest. So, there was nothing for it but to jump into the search and do some serious legwork. Exploring avenues for a ‘local’ supplier/manufacturer proved to be both time consuming and fruitless, unless I wanted to spend vast amounts of funding, which I simply do not have. I did come across a few interesting leads though. That led me to explore the possibilities of commissioning production from China. The language barrier was a difficult one to overcome, but a picture, as they say, paints a thousand words, in any language! I approached several companies with my design sketches. Numerous emails and weeks later, I finally hit upon an excellent source for the work I wanted. I paid a healthy sum for the setup fee and awaited samples. The whole experience was really quite exciting! With samples seen and approved, and another hefty sum parted with, my clips were now scheduled for production. How neat is that, thought I! With the clips scheduled and the samples to hand, phase two of the project needed to be put into place. 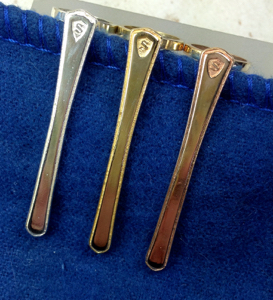 I had already sourced suitable establishments to perform the all-important task of plating to various finishes: Gold, Nickel Silver, and Black Oxide. The unplated clips were eventually completed and delivered to me. I counted out the first batches for plating and off they went in the post. A few months later, back from the platers they came, and I was truly proud of the end product. 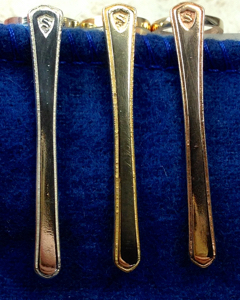 The clips have really nice finishes, with the shape I want, made to suit my very own specifications and pen models. I choose to call this the Exclamation Clip. Its shape reminds me of the exclamation mark, with a classic and functional design which will complement many of my pen styles. Offered as a standard clip with all base models, it fills a long-standing gap for me, and I am proud to present it to my customers as a truly bespoke item! I really am very proud of my achievement…. Have I written that already? The challenges faced and overcome in this quest have provided valuable experience and knowledge that will benefit both my business and my customers, paving the way for additional clip offerings in the future. And it all started with making an Exclamation! Another few weeks have passed in the Scriptorium workshop. 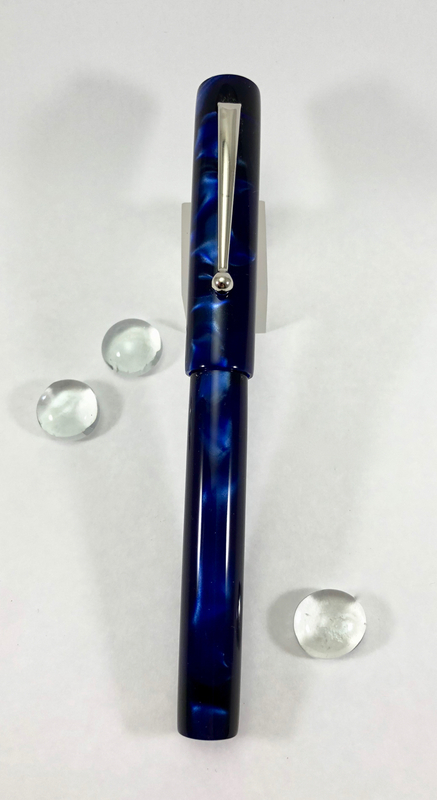 Pens have been posted to their new homes and many customers should now be enjoying writing with their new Scriptorium fountain or dip pen. Of course, I just love to hear how you are getting on with your new pen. Do please keep in touch and check the web pages from time to time, to read my blog and see what’s new in the Scriptorium workshop. I have a lot of new things planned for release in the future! I truly enjoy my pens-crafting work. It is a passion that provides tremendous pleasure through making something that could be around for many years to come. Engaging with my customers and trying to fulfil their requests is another aspect that is really quite rewarding. The material combinations, the colors chosen, and the design requests I receive never cease to amaze me. It gives me the inspiration to go the extra mile to bring those chosen designs to reality. Some time ago, I received a request to make a pen having a sword shaped clip. This provided a welcome design opportunity, as I have long wished for a sword clip myself. I chose to incorporate my love of British literature and history into this project. What would the design be? Should it look like some fabulous fantasy sword, or should it reflect an actual sword model? After much reflection, I decided to combine my love of the stories of King Arthur and the Knights of the Round Table with that of an actual sword design typical of the Anglo-Saxon period in English history. Specifically, I chose the look from the sword found among the treasure in the Anglo-Saxon royal ship burial site at Sutton Hoo in 1939. I particularly like the design of this sword, with its narrow crossguard, as it really complements the shape of a pen cap. The pommel and hilt echo the contours of the Sutton Hoo sword, and the blade even features a fuller’s groove down the middle. The tip of the blade has been gently rounded. With no awkward protrusions for the pen, it is ideal. There are no sharp edges, points, or elements that can easily snag in shirt pockets or pen wraps. Below are some design drawings of the final sword. As with any clip design, I go through a series of versions with my silversmith, Mike Redburn, to get just the right look. Below are a couple of Mike’s detailed 3D computer drawings. Mike utilizes the “lost wax” casting method, and the process from design idea to completed clip is fascinating. Following approval of a final design, a 3D printed model is made. Next, a silicone mold is created in one of two ways – either by making a mold of the 3D printed model, or the model can be cast and a mold can be made of the cast metal piece. After the mold is made, wax is injected into the mold to reproduce the part. It is then put in a flask, invested, and then burned out in a kiln. The remaing hole is filled with molten metal. Here is the final resulting clip! Every notable sword has a name…. And what name should I choose for this sword? Why, Excalibur, of course! This echoes my passion for the tales of King Arthur, The Round Table, & Merlin. 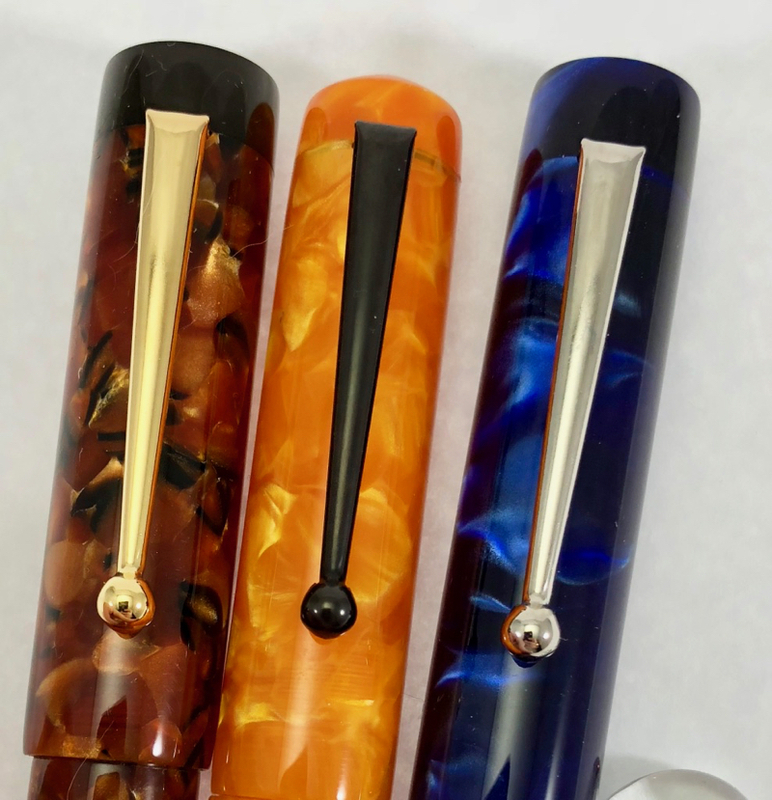 The clip is available in silver, bronze, or brass to add a unique touch to your custom pen. 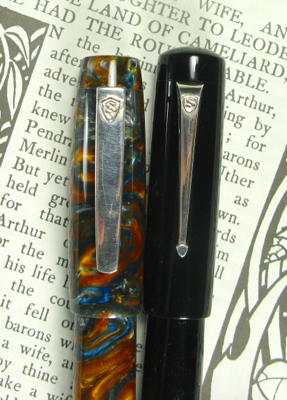 Do have a look at my Clips page for more information about these and other clip designs available, and… be on the lookout for a new pen model featuring the Excalibur clip, forged in the workshop at Scriptorium Pens, soon. The Exemplar – A New Model! Also in the News: More Clips! 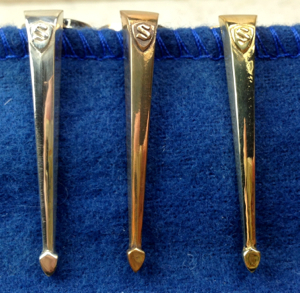 Custom clips in cast Brass and Bronze will be joining the already available Sterling Silver Custom Clip selection. They should be available in a week or two! 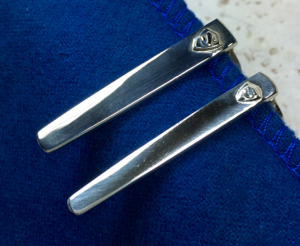 Custom Clips in Sterling Silver! 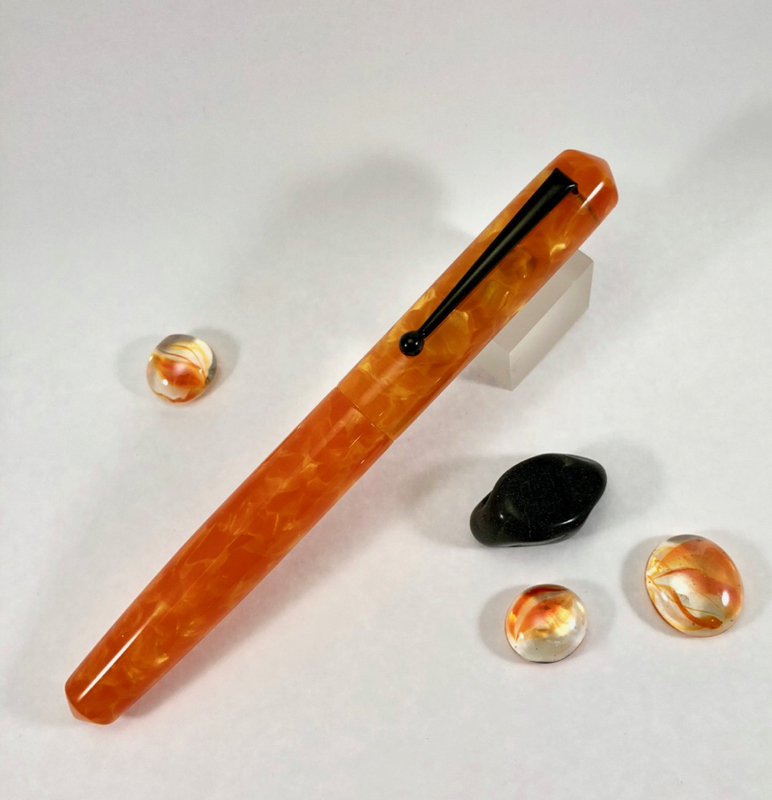 Scriptorium Pens now has its own custom clips! I’m super excited to introduce these two new clip designs, cast in Sterling Silver using the lost wax method. 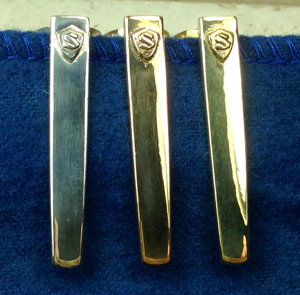 Available in both a classic and a modern style, these will be offered as an upgrade to the standard clips on any pen. 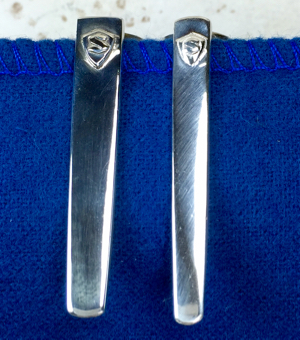 The Modern clip has a smooth, clean look, while the Classic version has a more traditional, vintage appearance. Both clips feature a calligraphic Scriptorium “S” on a heraldic shield as a decorative emblem. 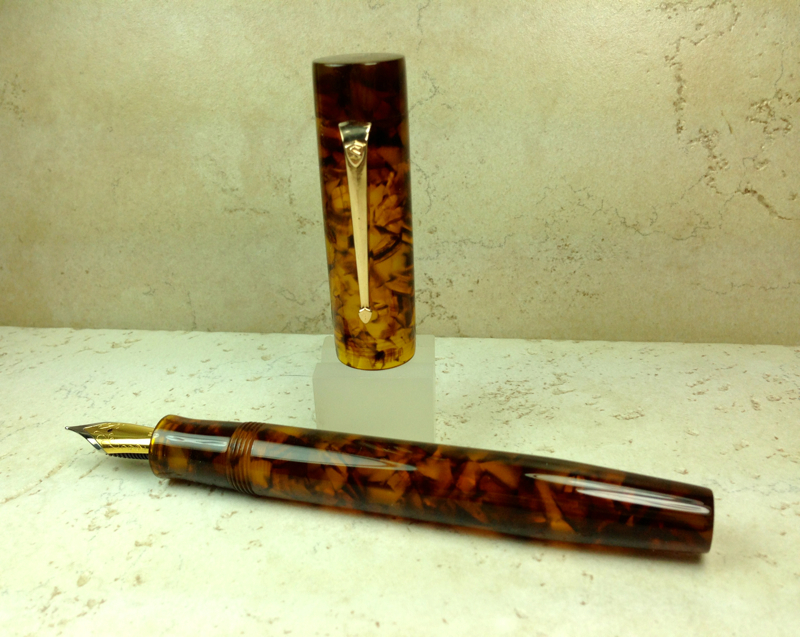 Each will add a distinctive touch to any pen.